Matt Klentak presenting an exclusive team hoodie to Phillies fan Rance Yundt after the latter won a bet with the former about signing pitcher Jake Arrieta. Whether Phillies general manager Matt Klentak's aggressive approach to free agency this year works or not remains to be seen. One thing we know for sure about the young executive, however, is that he's a man of his word. The Phillies shared the story of superfan Rance Yundt on the team's Facebook page Wednesday. Last week, Yundt was at his normal post outside Spectrum Field in Clearwater for some spring training autographs when he ran into Klentak. Yundt asked for one of the exclusive spring training hoodies the players have been wearing, but Klentak declined, saying those were only for the team. 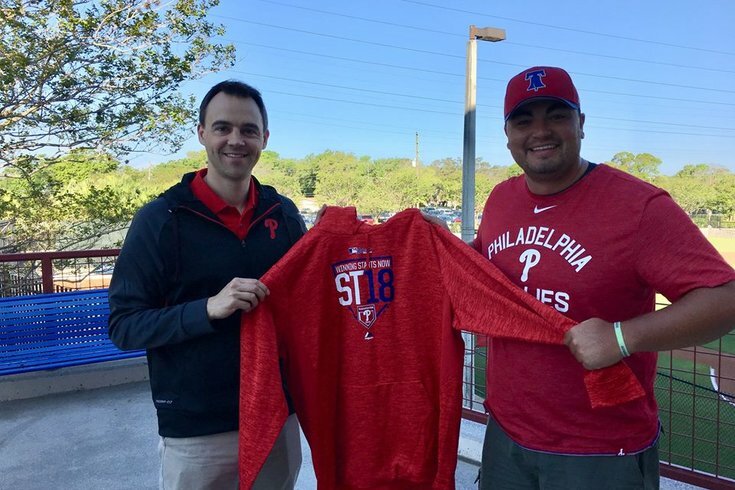 Apparently determined to snag one of the sweatshirts, Yundt proposed a bet: If the Phillies signed pitcher Jake Arrieta, Klentak would give him one of the hoodies. Klentak shook on it, and we all know what happened next. During the Phillies' Sunday game against the Baltimore Orioles, Yundt found Klentak once again, and the general manager made good on the wager. Matt Klentak is a man of his word. **DISCLAIMER** from the #AtPhils squad: While Matt is awesome and this anecdote is great, please just appreciate a good story and don’t bombard our GM with apparel requests. Something tells me many fans will not heed that plea.